Oysters on the half shell are such a treat. This Mexican influenced recipe includes an adaptation of “Hog Wash”, from our friends at Hog Island Oyster Company. Salmon caviar is widely available on the internet if your local fish market does not carry – or they may order it for you. This cheesy, creamy dish originated at a Sanborns cafe in Mexico City in 1950. Its name, “Swiss enchiladas,” in English refers to its copious use of dairy. You could use chicken, crab meat or even slow cooked pork. The creaminess of the dish is delicious with the Russian River Ranches Chardonnay. Mexican Chicken Soup with Lime Typical of flavors found in the Yucatan. The bright lime flavor goes beautifully with the crisp Les Pierres Chardonnay. And yes . . . you can have wine with soup! This cooking technique gives the chicken the crisp, crunchy crust we all love with a minimum of fat. This chicken recipe is superb for a springtime picnic and paired with Sonoma-Cutrer’s Russian River Ranches Chardonnay. Farro is a favorite grain in Italy. The term farro is used when referring to three ancient wheat varieties first cultivated in the Fertile Crescent and still grown in Italy: farro piccolo (also known by the German einkorn), farro medio (also known as emmer, the Hebrew word for mother), and farro grande (also known as spelt). The imported Italian farro available in the United States is usually the emmer variety. It’s usually labeled perlato or semi perlato (pearled) meaning it retains some, but not all of its bran and nutrients. It is still a very healthy grain. Most recipes are written for this kind of farro; which requires no soaking and cooks quickly in about 25 minutes. This dish pairs nicely with Sonoma-Cutrer’s bright, fruity Pinot Noirs such as the Owsley. I’m using salmon caviar here but you could use smoked salmon or even shaved truffle if you’re feeling flush. The custards can be baked up to 4 hours ahead. Reheat gently in a water bath. This dish is especially delicious served with the complex Sonoma-Cutrer Founders Reserve Chardonnay. This recipe depends on sourcing the best scallops available. Diver scallops (which are also known as dry pack) are harvested daily and never put into a brine solution. This recipe makes more cauliflower puree than you’ll need but that’s a good thing! Cover and refrigerate for another use. The 2016 Russian River Ranches Chardonnay pairs beautifully with this delicate dish. This simple, beautiful salad is easy to make and reflects the flavors of winter and spring with beets and oranges. The bright citrus notes makes this salad a good pairing with Sonoma-Cutrer’s Sauvignon Blanc. This is a delicious dish that can be done with any fresh, meaty and sustainable fish. It uses a curry mixture called laksa, which has come to mean a spicy coconut milk based dish with or without noodles. It has its roots in Malaysia. In place of the spinach, you could use other Asian greens like steamed baby bok choy. Fregola is basically a pasta that is made in the same manner as couscous with coarse ground semolina flour. Fregola is toasted, giving it a nutty, wheaty, roasted taste. This dish captures complex, earthy flavors. A Southeast Asian version of traditional steamed clams. The bright citrus flavors of the vinaigrette complement the salmon beautifully. Serve as a starter course for something special. This is an elegantly simple dessert recipe. If good blueberries are not available, then use whatever fruit is best in the market. Black Cod (also known as Sablefish or Butterfish) is a sustainably caught fish, much of which comes from the Pacific coast from Northern California up to Alaska. Miso is the traditional Japanese fermented paste, often made with soybeans, but also with rice and/or barley. It makes a wonderful marinade and the following recipe can be used on all kinds of fish, chicken or pork. Serve with steamed rice. This is a simple salad to make, but it captures those wonderful Fall/Winter flavors. You could substitute other fruits for the apples such as ripe pears, fuyu persimmons, etc. Other greens will do, if you can’t find frisée, which is also known as curly endive. A hearty chowder that is the definition of comfort food, especially on chilly nights. These Indian-inspired bites are vegetarian, but even non-vegetarians will love them.The beauty of these Samosas is that they can be made ahead of time and frozen until it’s time to prepare for the party. Lindsey Shere is a legendary pastry chef in California and this tart became a signature dessert. Adapted from Lindsey’s original recipe and tweaks by David Lebovitz. This tart is best eaten with the fingers; it is too hard to cut easily with a fork. It is a good picnic dessert because it is virtually indestructible. Delight guests with something different this holiday! The blackberry sage sauce can be made ahead, refrigerated and reheated. Serve with an earthy combination of pan-roasted mushrooms and sautéed greens. Note the cooking method starts with a cold pan. Gradually heating draws out more of the fat and crisps the skin of the duck. A beautiful salad that captures the flavors of the season. Blue cheese is called for in this recipe, but you could use any cheese that you prefer. Also, if Asian Pears aren’t available use apples, mangoes or whatever else is best in your market. Quality of the scallops is crucial to this dish and fresh “Day Boat”, “Diver” or “Dry Pack” jumbo scallops are called for (order from your fishmonger). Day boat scallops are harvested daily and never put into a brine solution. As a result, the texture is meatier and they sear or grill beautifully, as opposed to those that have been soaking in a brine solution which is usually laced with tripolyphosphate that bleaches the scallop and encourages it to soak up water. This brightly colored soup is delicious either hot or chilled. You can punch up any of the flavor elements to your taste. Pomegranate molasses is readily available in Middle Eastern grocery stores or online. Pomegranate molasses, also referred to as pomegranate syrup, is a tart-sweet reduction of pomegranate juice with the consistency of maple syrup. Used in the cuisines of the Middle East, India, Armenia, and Georgia, pomegranate molasses varies in taste, color, and viscosity by region. Named after a town in central Italy outside of Rome, Amatrice was in the news in August 2016 for a devastating earthquake that leveled this beautiful old village famous for its iconic pasta sauce al’ Amatrician. Many restaurants and chefs around the world have been serving this dish since then as a way of fundraising for earthquake victims. It’s a simple preparation but with amazing flavor. I’m using bucatini here, a long pasta with a hole in the middle, but spaghetti or any other pasta that you like works fine. Baking salmon at a low temperature ensures that the fish will be very moist since most of the delicious oils and moisture aren’t lost. This recipe depends on getting the best scallops available. Diver scallops (which are also known as dry pack) are those that are harvested daily and never put into a brine solution. As a result the texture is meatier and they sear or grill beautifully, as opposed to those that have been soaking in a brine solution which is usually laced with tripolyphosphate and which encourages the scallop the soak up the water. Asian flavors have become the most popular ethnic foods in America. The crisp Les Pierres Chardonnay with lovely balance can go beautifully with these flavors. In this first presentation of this exclusive SonomaCutrer.com Live-stream series, the James Beard award-winning, Chef John Ash, shared his insights on the basics of wine: Serving, Selecting, and Tasting. On Wednesday, July 1st, Club Cutrer members gathered together in the newly renovated tasting room of Sonoma-Cutrer Vineyards. With a perfectly chilled glass of wine in hand, everyone’s attention turned to SCV Head Chardonnay Winemaker, Cara Morrison, as she introduced long-time friend of the winery Chef Ash. In addition to the in-house audience of Cutrerians, remote viewers also joined the live discussion and submitted questions online that were answered on the spot by Chef Ash. Watch the full video of this informative and entertaining presentation on the basics of wine serving, storing and tasting that highlights both practical and fascinating aspects of wine culture. What is “corked” wine and how does it get that way? What should I look for in a wine glass? Why do some wines use a screw cap and others don’t? What are sulfites? Why should I care if they’re on the label? Should I send a wine bottle back if it’s bad? What if I just don’t like it? What’s the difference between sustainable, organic, and bio-dynamic wine? Should I store wines standing up or lying flat? Should I store wine in the dark? If the screw cap is so effective, why isn’t everyone using it? Watch the full video and get satisfying answers to these and more questions, along with Chef Ash’s take on why legendary chef Julia Child always drank wine while she cooked. A delicious bowl of soup created with seasonal vegetables such as, Pumpkin with Wild Mushrooms, Radicchio with Smoked Goat Cheese or Winter Squash Soup paired with a glass of Russian River Ranches Chardonnay is always a great combo for a cozy night in. California enjoys a long fig season from May all the way to December. Pick up some fresh Figs and Gorgonzola Cheese for a quick and delicious appetizer to enjoy with a glass of Sonoma Coast Chardonnay. Bored with beef? Stuffed Red Peppers with Boar pair very nicely with a glass of Russian River Valley Pinot Noir. Pan-Roasted Chicken with Tarragon Mustard is a warm and flavorful dish to have on a cool evening and goes wonderfully with Russian River Ranches Chardonnay. Finally, the ultimate comfort food on a cool fall evening is a delectable dish of Macaroni and Cheese with Sonoma Coast Chardonnay. This menu is built to impress. It is an interesting combination of flavors to serve when the boss comes over or to celebrate any special occasion. This dish makes a beautiful starter course. It’s key to use absolutely fresh “day boat” or dry pack scallops. The salad is one of my favorites and delicious on its own. Celery root can vary widely. Pick ones that are heavy for their size, which means there won’t be a hole in the center. Taste the celery root after cutting and if it seems tough or too strongly flavored then blanch it for a few seconds in salted boiling water followed by a dunk in ice water to retain its crunch. Sonoma-Cutrer Sonoma Coast Chardonnay would be perfect here. This is a very simple soup but brings together interesting contrasting flavors – – bitter from the radicchio and smoke from the cheese that I think are delicious and intriguing. I like to use smoked goat cheddar. This dish requires a chardonnay with great fruit, like the Sonoma-Cutrer Russian River Ranches. This is an old catering technique where beef can be cooked ahead and held perfectly. Delicious with Sonoma-Cutrer Pinot Noir. This is a very simple recipe that depends entirely on the quality of the walnuts. If you suspect your walnuts have been in storage for a while, place them on a baking sheet in a preheated 375° oven and lightly bake for 3 to 4 minutes to “refresh” their flavor. You can also substitute any other nut you like for the walnuts. Enjoy Sonoma-Cutrer Late Harvest Chardonnay with this cake. Surprise your beloved with these recipes that are sure to spark romance any day of the week! This recipe makes a beautiful starter course. Celery root is one of those underappreciated ingredients that deserves more love. Pick celery roots that are heavy for their size, which means there won’t be a hole in the center. Taste the celery root after cutting, and if it seems tough or too strongly flavored, then blanch it for a few seconds in salted boiling water followed by a dunk in ice water to retain its crunch. This is delicious with any Sonoma-Cutrer Chardonnay and something special to share. Peel, thinly slice and chop the celery root into a thin julienne. In a separate bowl, mix together the mayonnaise, buttermilk, mustards, lemon juice, vinegar and salt and pepper to taste until smooth. Stir in celery root and apple to evenly coat. Season to taste with salt and pepper. This is best done at least an hour ahead and chilled for the flavors to develop. Mound the celery root mixture on plates and artfully arrange the salmon on top. Top with caviar and chervil sprigs and serve immediately. Properly made, macaroni and cheese can be transcendent. It should be delectable with a velvety sauce, and the pasta should be firm. There should be just enough toasted bread crumbs on top to add some crispiness. Start with a béchamel sauce made by making a roux. Add milk, a little nutmeg, cayenne, dry mustard and a bay leaf. Cook this for 30 minutes to deepen the flavor. Then, add both a tangy cheddar and a nutty Gruyere. Pour it over cooked macaroni or shells that cup the cheese sauce. Top with a judicious amount of panko bread crumbs mixed with some more cheese and then drizzle a little cream around the sides before the pan goes into the oven to ensure nicely crisp edges. What could be better than sharing decadent macaroni and cheese and a glass of Sonoma-Cutrer Chardonnay with your sweetheart? Heat the oven to 350°. Toss the panko bread crumbs with the 2 teaspoons melted butter on a baking sheet. Toast the bread crumbs until lightly browned, about 8 minutes. Set aside to cool. In a large saucepan, heat the remaining 1/2 cup butter over medium heat then whisk in the flour. Stir until the mixture is smooth and bubbling, about 2 minutes. Remove from the heat and whisk in the milk. Add the dry mustard, white and cayenne pepper, nutmeg, salt, bay leaf and sherry. Heat and stir to boiling, then reduce the heat to a low simmer and cook 30 minutes, stirring occasionally. Taste and adjust seasoning to your preference. Remove and discard the bay leaf. Stir in 3 cups of the cheddar and all the Gruyère until melted. Pour the sauce over the cooked macaroni in a large bowl, stirring until all of the macaroni is coated. Pour the macaroni into a well-buttered 9-by-13-inch casserole. Drizzle heavy cream around the edges of the casserole. Sprinkle on it the remaining 1 cup cheddar cheese, then the toasted bread crumbs. Cover the casserole with aluminum foil. Bake 20 minutes. Remove the foil and bake uncovered an additional 10 minutes. Put under a preheated broiler for 5 minutes to crisp and brown. This dish exemplifies how just a few fine ingredients can create a superb dish. The key in this recipe is to use a quality pancetta or bacon. Bucatini is spaghetti-shaped, but a little thicker and hollow in the center. You could certainly use regular spaghetti of good quality, too. All kinds of variations are possible within this recipe; including the addition of finely chopped ripe tomatoes, thinly sliced and sautéed onions, tender spinach leaves. Pair with a glass of Sonoma-Cutrer Pinot Noir! Bring 3 quarts of lightly salted water to a boil in a large pot. Add the bucatini and cook till just tender but firm to the bite (al dente). While the pasta is cooking add the olive oil to a large sauté pan large enough to hold the pasta later on. Over moderately high heat, sauté the pancetta till browned and nearly crisp. Drain off all but 2 tablespoons of the fat. Quickly drain the pasta, reserving 1/2 cup of the cooking water, and add to the sauté pan. Using tongs, toss with the bacon. Add the parsley, zest and cheese and toss again adding the reserved pasta water. Cover and let rest for one minute on very low heat to allow pasta to absorb the flavors. Serve immediately in warm bowls with grindings of black pepper to taste. Dungeness is a rich, succulent delicacy to be savored when in season This is a great dish from the past, and uses a classic egg yolk thickened sauce. It’s traditionally served on toast points but can also be spooned into little puff or choux pastry shells or in crepes. 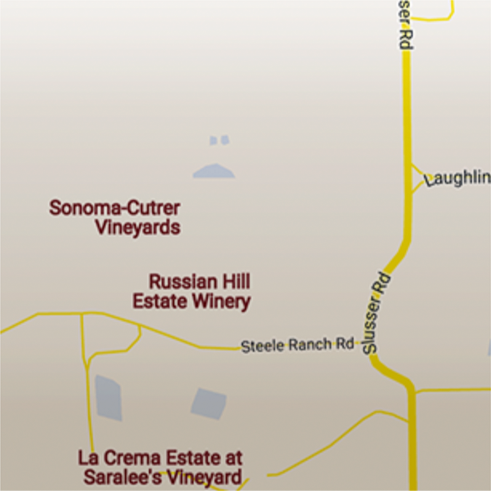 The mineriality of ​Sonoma-Cutrer Les Pierres is a great match here. An easy and authentic version of this classic. The key to crab cakes is not to over mix and shred the crab. These crab cakes pair well with our Sonoma Coast Chardonnay. This Smokey Corn Chowder is a heart-warming comfort food and pairs well with our ​Russian River Ranches Chardonnay. These rich seafood strudels pair nicely with our Founder’s Reserve Chardonnay. Serve them at your next dinner party and wait for the rave reviews. Perfect for the Thanksgiving (or harvest) table, this seasonal soup showcases pumpkin along with another fall favorite – – wild mushrooms. Serve with a glass of the ​Sonoma-Cutrer Russian River Chardonnay. In this German-inspired salad, red cabbage and pancetta combine for a sweet and salty, rich with color meal Try Bucheret, Camellia or Crottin cheeses from Redwood Hill Farms (www.redwoodhillfarms.com) or the Humboldt fog or Bermuda Triangle from Cypress Grove (www.cypressgrovechevre.com). Serve with Sonoma-Cutrer Les Pierres Chardonnay. This is a very simple soup but brings together interesting contrasting flavors – – bitter from the radicchio and smoke from the cheese that are delicious and intriguing. This dish requires a wine with great fruit, like the ​Sonoma-Cutrer Russian River Ranches Chardonnay. This simple-to-make seasonal soup will warm your heart! The Russian River Ranches Chardonnay is a wonderful complement for this soup. This Frisée salad recipe is an extravagant entree salad. A base of frisee greens is piled high with crumbled bacon, maple syrup and shallots. This upscale version of a classic recipe will become a new brunch favorite. Pair with The Cutrer.